Open to all registered adults, Wood Badge is the premier adult training program for the Boy Scouts of America. 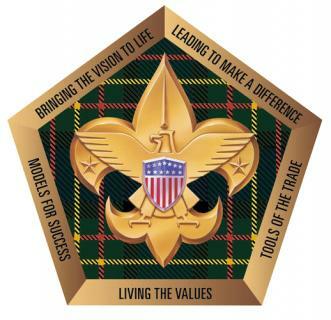 Why do we offer Wood Badge? To build stronger units. You will make your Scouting unit — and your sons’ and daughters’ units — stronger. To learn the what and why of Scouting. You will have a deeper understanding of what Scouting is and why we do it. To enhance experience. You will learn and experience things that will stay with you in Scouting and the rest of your life. To have fun. You will have fun and you will meet interesting people. To help other groups. You will make your other groups, like work, church, even family, stronger. The course covers all aspects of Scouting from Cub Scouts, Scouts BSA, and Venturing. Wood Badge combines the most current leadership skills used by corporate America with the best elements of successful leadership programs from over 100 years of Scouting experience. The course is completed over two three-day weekends (7:30 am Friday - 5:00 pm Sunday) which encompasses the practical training and application. Come be part of a mountain top experience, grow personally and professionally, but most of all gain that diverse knowledge of Scouting and increase your Scouting network.